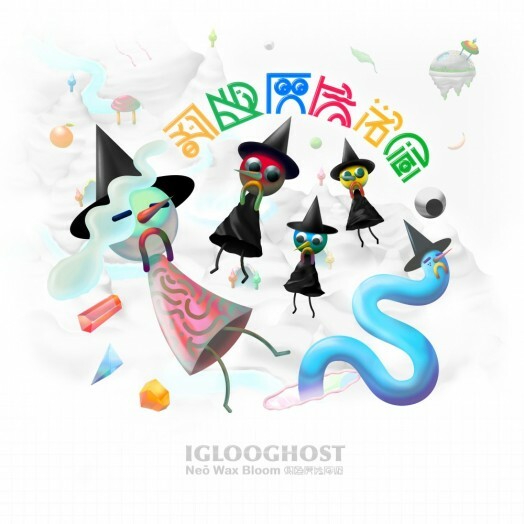 In 2017, Iglooghost will release his debut album “Neō Wax Bloom”, almost two years to the day since he made his debut as a teenager on Flying Lotus’s Brainfeeder imprint with the “Chinese Nü Year” EP – four tracks documenting the time-traveling adventures of a gelatinous worm-shaped creature called Xiangjiao. Expanding on this story, “Neō Wax Bloom” follows the events surrounding two giant eyeballs crashing into the mysterious world of Mamu. Across its 11 tracks, Iglooghost builds a typically intense, hysterical, borderline batshit crazy soundtrack, introducing new characters to his fantastical world and inviting back old friends Mr. Yote and Cuushe for the ride. Featuring artwork by Iglooghost, the vinyl format includes a large format 12-page Riso printed comic booklet and “Neō Wax Bloom” character sticker sheet.